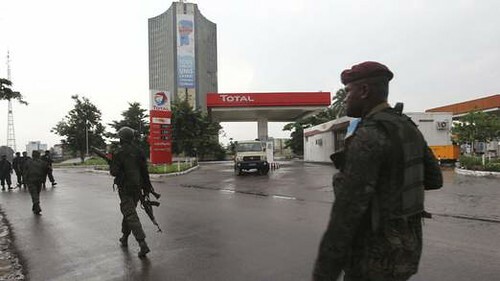 Gunmen attacked the airport and state television headquarters in the capital of the DRC in what appeared to be an attempt to seize power by religious leader Paul Joseph Mukungubila., a photo by Pan-African News Wire File Photos on Flickr. KINSHASA. — A pastor whose supporters have claimed a wave of attacks across DRC is “on the run” and has fled the country, government spokesman Lambert Mende said yesterday, adding that the death toll from the violence had risen to over 100. Pastor Joseph Mukungubila Mutombo “has vanished . . . He himself does not believe that his cause is right, a cause for which he is claiming responsibility in phone calls from a neighbouring country, or not too far away from ours,” Mende told a news conference. Mende said the final toll from Monday’s attacks was “very heavy”, with “103 people dead including 95 terrorist assailants and eight members of the DRC armed forces”. Congolese security forces on Monday repelled seemingly coordinated attacks in the capital Kinshasa and other cities, in fierce gun battles. Armed youths believed to be loyal to the pastor who challenged President Joseph Kabila in elections seven years ago stormed the state television station, the international airport and the military headquarters. Mende said several of the men who carried out the attacks had been involved in earlier violence and could not expect an amnesty. “The identification (of killed assailants) has established . . . that most attackers are recidivists who have been amnestied before, which is why this time they will feel the full force of the law,” he said. Mende also stressed that no members of the police or the military were part of the “terrorists”.